Felix and I both are kind of working on it When we started on this, it was 98/99 and I was 17... now I'm 37 with big boy responsibilities, Wife, 4 kids, jobs, etc. so I cram in time like right now, early morning or late night. I call it my "nerd time" haha. He's always looking for gigs and such in the film industry in Denmark where he lives, on-again, off-again. I kind of dragged him back into this. That's it, yeah. Most of the active discussion takes place in the Blood Discord channel, its real sporadic here in Duke4. Enjoy getting back into it! I don't know if you already have a solution for the annoying flickering, but I've attached a fix that Felix had cooked up. I just drag this onto my dosbox launcher and no visual issues at all... and don't forget to disable the beeps hahaha... those are so annoying. My next question was EXACTLY going to be about the flickering. Umm...did I miss that attachment? I didn't see it in your post, or either this forum is a bit awkward. PagB got me back into it as well. Hopefully, Felix is enjoying his Blood revisit and has some passion for it. You guys keep up the good work! Given that you are working on a BPF remaster, can you address the fact that there is almost no health on the ghost town level except for the doctor's bag and the life seed? Will do. I'd like to know how many have problems with the snow in the first map still? Ive never had a problem with it on any of my systems, DOSBox or GDX. I wish to get to a point where everybody will have no problems with art, sounds, snow, etc. It just blows my mind that some people in this day and age experiences slow down from the snow. I got to playing Blood recently now that there are a couple of source ports. 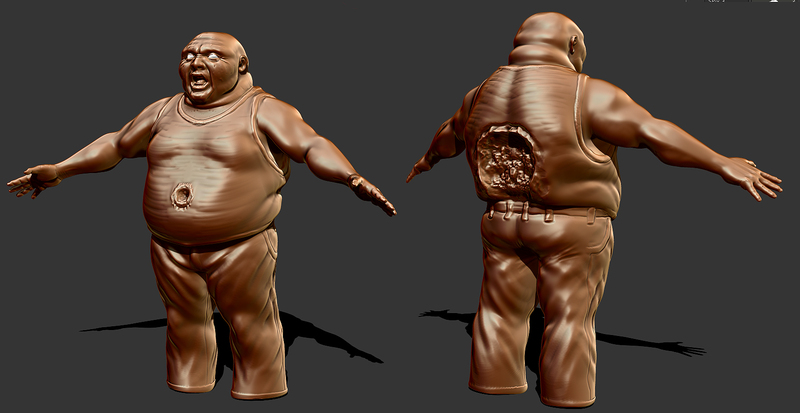 I was chatting to Mark, and for some sculpting practice, I did this guy. I need to fix some anatomy issues (apart from the sprite body proportions that is). 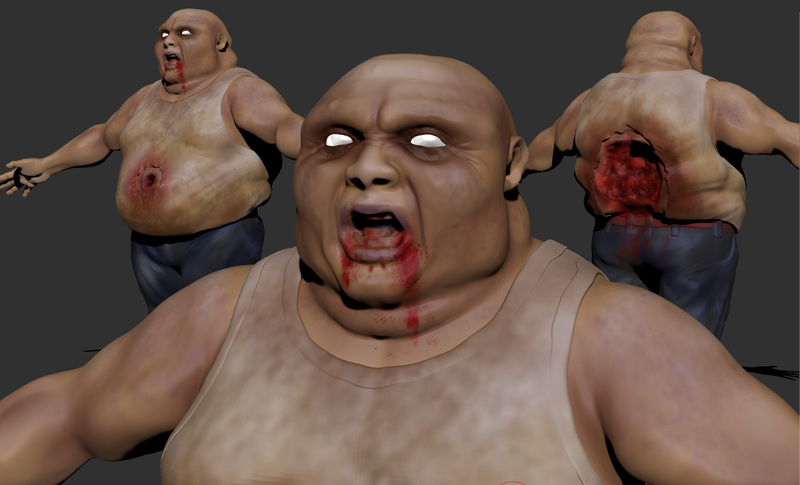 When we were chatting about nBlood I asked TM if he would throw some clothes on this model I "borrowed" from Killing Floor and used in my GraveyardTC. Instead he got inspired and started creating The Butcher from scratch. For fun I'll probably throw him in the Blood bonus map in Graveyard and take a few screenshots. If a good Blood HRP gets going I'm hoping TM will make his game ready with full animations. Trying to come up with some new map ideas for my "A Bloody Mess" addon. Drinking and mapedit, lol. I find it almost as bad as drinking and driving. My concentration goes far askew. ski resort is an excellent level theme. Let us know if youre gonna work on it, if not..hmmmm.. I decided to placeTM's WIP model into my latest project for a quick test to see how it looks in Eduke32. Those are looking great so far Teamonster. I've been editing the upscales of the Blood cultists as the upscaling wrecked the faces in most frames.